That did the trick, got it up and running and I too have noticed a signifigant performance increase over 2.4.20-gentoo-r1. All I have to do is get sound working(looks like I'll have to use OSS) and I'm done. Got OSS running and working fine, now I'm having a problem compiling svgalib against the 2.5.64 kernel, is that normal? I have read some of the posts about these patches (linus+ingo combo) on kerneltrap, and if it's even half as good as it sounds then I'll be more than happy. So I'm gonna build kernel 2.5.64 patched with bk9 now. If I get my bttv card, the nvidia card and my crappy intel8x0 integrated soundcard working (using alsa from the kernel), then I'll never look back at 2.4.x again. EDIT: The kernel.org mainpage says that the latest snapshot for the beta kernel is 2.5.64-bk9.... However, there exist no such file, latest one is bk8.. Wonder if someone's been drinking too much? now I'm having a problem compiling svgalib against the 2.5.64 kernel, is that normal? Yes, I saw that after posting, but didn't feel like updating my post again. So right now I'm compiling 2.5.64-bk10... Feels very exciting. NUMA means Non-Uniform Memory Access. It means that there are areas of memory that are specific to a CPU or faster to access from a specific CPU and other areas of memory that are common to all CPUs. I have also got the idea somewhere that at least in the context of scheduling, SMT (Intel likes to call it HyperThreading - how fluffy and cute!) is actually a special case of NUMA. No, I do not understand how. Perhaps all that was said was actually just that work done for NUMA systems increases performance on SMT systems or vice versa. Anyway, I'm going to try a 2.5 kernel rather soon, perhaps when 2.5.65 is released or even sooner... My hardware is pretty similar to Lovechild's (Athlon XP, KT333-based motherboard, Soundblaster Live!, Radeon 7500) so I'll hopefully be able to bug him for help if something goes wrong . NUMA means Non-Uniform Memory Access. It means that there are areas of memory that are specific to a CPU or faster to access from a specific CPU and other areas of memory that are common to all CPUs. 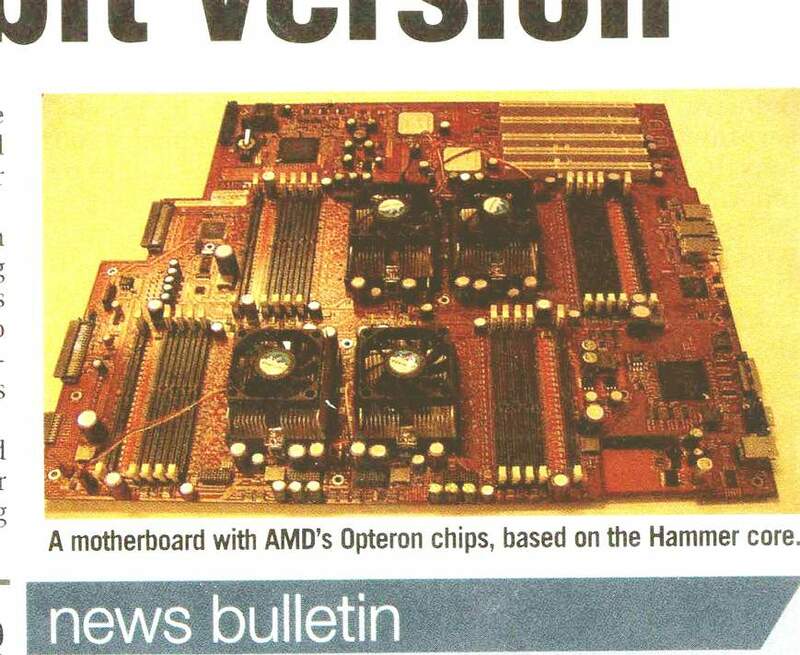 Opteron is a good examle of a NUMA-system. Each CPU has it's own memory-bank that it's connected to, but each CPU can also access the RAM attached to other CPU's as well. For visual aid, check out this pic. As you can see, each CPU has 4 DIMM-slots that are directly attached to the CPU, but each CPU can access the other CPU's slots as well. "PM me for tech support and DIE"
in my sig.. I have half my inbox' filled with tech support requests. I'm running 2.5.64-bk10 now, can't say that I notice so much difference, but I think the most difference will show under some heavy load. Anyway, it runs fine. Lovechild, don't worry - I know it's much more effective to post on a public forum asking for a specific person's help, thus letting peer pressure do its work, than to send a PM which can just be ignored (you can, for example, claim to have lost in the masses of requests). So I won't be PMing you any time soon . Anyone knows if there's a way to make the nforce2 integrated network adapter work with the 2.5.X kernel ? I have a leadtek card, so no 3com ethernet integrated. To the people talking about patching nvidia-kernel for use with linux 2.5: It seems to me there's no need to. nvidia-kernel-1.0.3123-r2 and nvidia-kernel-1.0.4191-r2 get patched with those patches by portage. And if you don't believe me, just look in the ebuilds. Wow, compliments to the developers, I didn't even think about it. BTW: Am I the only one who had to edit /sbin/modules-update not to delete /etc/modprobe.conf? NPTL compiled in again. The segfaults was cause xmms and mplayer was compiled with opengl support and with glx not working with NPTL they decided to segfault. Recompiled them with -opengl and works like a charm. The high number of bk releases is cause the lingo (linus+ingo combo) interactivity patch spawned so much interest in the devkernel among users that previously never had run it, thus alot of new bug reports to sort through and fix. Also, hopefully a big batch of the less extreme patches from the mm tree will get into .65 cause some of them just makes sense (I stripped the extreme RAM usage patch and the lingo patch and the mm tree still showed tendencies to outperform vanilla dev kernel). Update: bk11 !? C'mon you got to be kidding me... starting to think they're doing this just to see how many we can take before we riot. I mailed Andrew Morton with the result of this and lets hope someone fixes the problem soon - because I'm not enough of a kernel hacker to look over the rather massive changes that have gotten in with that changeset (even the diff between this and the previous changeset is huge). Go go gadget kernel hacker bribing..
2.5.65 is out, the wait for those that didn't fiddle with bk releases (like myself) is finally over. Give it a whirl, it's not magical but some do find the difference overall to be very noticable. Installed, runs just fine. Makes mplayer movies skip during background load though for some reason (2.5.64 did not), xine still works OK though. The "make gconfig" GTK2 interface made me happy too (is it new or have I just completely missed it in previous releases? ), overall a nice kernel well worth a biscuit or two. just compiled 2.5.65... nothing special to mention here. Ive got the feeling that the patched 2.5.64 kernel offered a little more responsiveness than the new one. does anybody know how the kernel developers integrated the ingo-linus patch?